This is the schedule for our Taking Victim Services to the Next Level 2019-20 trainings. The training will provide strategies on how organizations can adopt a diversity framework, enhance leadership and budget, and increase language access. As space is limited and the training is FREE, we highly encourage Executive Directors and Managers of organizations/agencies providing domestic violence services to register. 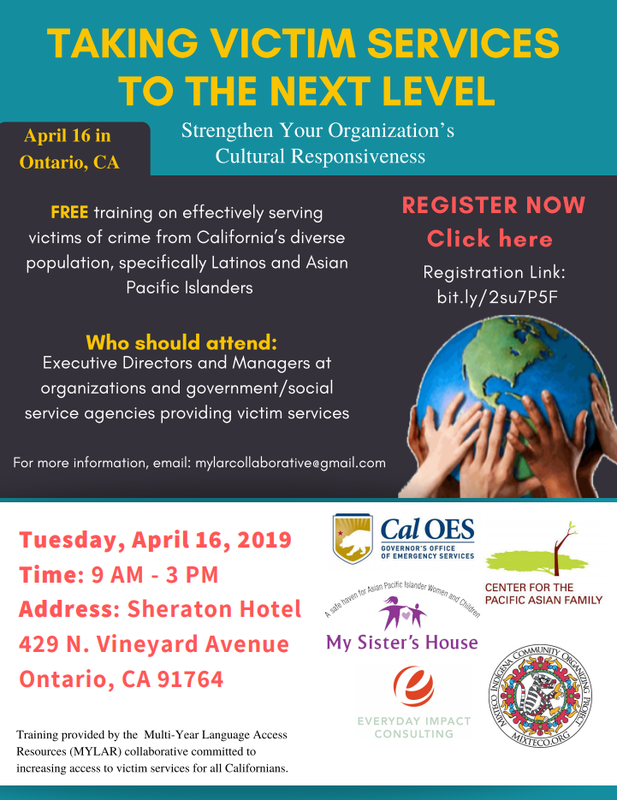 The training is a part of the project of the Multi-Year Language Access Resources (MYLAR) Collaborative led by My Sister’s House, Center for the Pacific Asian Family (CPAF), Mixteco Indigena Community Organizing Project (MICOP, and Everyday Impact Consulting. If you have questions please email mylarcollaborative@gmail.com.